All shirt purchases should be sent through Julie. She posted her paypal address. Chris you got a PM. I kid, I kid... Alluding to something inappropriate on a family forum is a great way to be smacked by the townspeople of Frazee... I'll hush now. It's okay, that club is very family oriented. There's an arcade and bowling alley in the next room. Oh! So bring the kids, and send them off to the next room? That sounds like a plan! We should have our meet and greet there... But I think there would be too many distractions. We should get this thread back on topic. We have had our fun, back to the car. Yeah, back to the car. I still can't believe Tyler decided to have the car painted florescent pink....damn let the cat out of the bag. Time for a photoshop. Actually.. I have in front of me photos of a painted brake caliper. 1989 Grand Am brake calipers, painted up in dayglo orange. I think he plans to take his car hunting with him..
And man, do they look goooood. Not as good as the car is going to look. Now he just needs to complete the image by wearing a leopard print hat with a huge brim, and a peacock feather hanging out of the hat band..
Might need to convert the car to a sunroof or T-Top for that though. Anything new on the fender? Anyone text the seller in Michigan about his? nearly 18,000 members and we can't find a fender up in that region? FieroSTS stated he may have the fender... We don't want you to pull yours of of an Indy, no matter what. Whatever the car hit, it ripped through the nose, and caused the impact beam to rotate down. It also caused the fascia mount where it joins the fender on the driver's side to rip the fender mounts. That is why the fender is damaged, it tore the mounting locations out of the fender. The new GT Quarter Windows arrived. Dave and Karen were very impressed with them, and stated they looked very good. The lower rocker panels came in as well and are in very good shape. Perfect to be prepped and painted. Ok--I guess I mis-read the posts. I thought you said it needed to be there by monday and he (FieroSTS) stated he wouldn't be able to ship it till mondy. Ok--I guess I mis-read the posts. I thought you said it needed to be there by monday and he stated he wouldn't be able to ship it till mondy. FieroSTS is in Wyoming, MN. Kev was thinking about heading up there this weekend to start some prep work. This would allow us a little bit of breathing room by having a large portion of the panel/dash/interior removal done in advance. We would only need to reassemble with new materials when we get there. The windshield will be out of the car while we work on it. Then will be reinstalled on Saturday, with the body panels. Here is the snail mail tracking # 0309 1140 0002 3049 2875. UPS wasn't open till 2pm. so I sent it from the post office down town. Edit: These are both front and rear left side markers. Wow, just wow! I somehow had missed this thread and associated threads for the past 2 week. This is freakin awesome! I'll go through the what's needed list and see if I can find anything in PA when I go home this weekend that you guys still need. 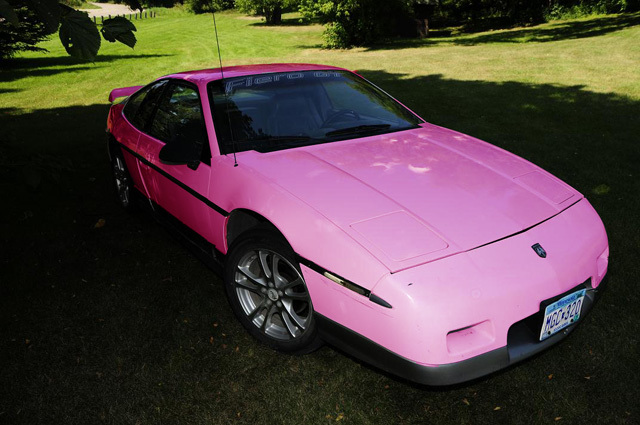 Edit: Cliff, could you tac this to the top of the general fiero chat thread list? Awesome! Are you shipping to Nick or the body shop? The shop needs them because they have to paint them up. You guys don't know how happy I am that the quarter windows made it up there in one piece. You should have seen the box though, I could have put two engines in that box and it was entirely filled with peanuts and bubble paper. I think a school bus could have run that thing over and not damaged those. It is the extra care that is needed to ensure this project goes off right. Aren't you glad the money was there to help cover that nearly $60.00 shipping bill? If the windows fit and look good, your friend Chris will have himself a healthy side business. I sent them to this address. Don't tell me I messed up?! You forgot the purple racing stripes!! The spoiler needs to be about 12 inches high too. Add some blue underglow effects as well please. I'd like to see what the super secret surprise I have in store looks like. I hope you aren't still thinking about mounting a potato gun on the hood. Wow! You really are old! Potato Guns are so 1860's... No.. Fog machines and underglows.. Then the car will really look like it is out of this world.. Floating on a cloud wherever it goes. Don't forget about the white wall tires, custom mud flaps and he'll need one of those little dogs with the nodding head mounted in the back window. Call him "Up Town Tyler" soooooo cool he just has to be from Frazee, MN. Can somebody verify the condition of Tyler's shifter boot? I was PM'd that it looked torn from the pictures. Not just any balls....blue balls. haha Tyler had a 1984 SE prior to the 86 GT and it had a complete velvet interior Tyler's reasoning "The Ladies Love it"
If you want me too, let me know and I'll take that last pic down. Sometimes I forget all those eyes on us.